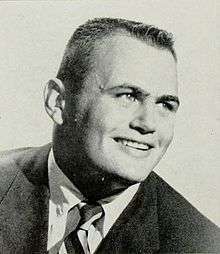 Donald Dee Shinnick (May 15, 1935—January 20, 2004) was an American football linebacker who played as a collegian for UCLA and then thirteen seasons in the National Football League for the Baltimore Colts. He had 37 career interceptions with the Colts, still an NFL record for a linebacker. After retiring as a player, he served as an assistant coach with the Chicago Bears, the St. Louis Cardinals, the Oakland Raiders and the New England Patriots. He died at a rest home in Modesto, California on January 20, 2004 of frontal lobe disorder. ↑ Los Angeles Times (January 23, 2004), Don Shinnick; was linebacker for Colts, coach for Patriots The Boston Globe. Retrieved on October 25, 2009.